Murray River Pink Flake- Australia. 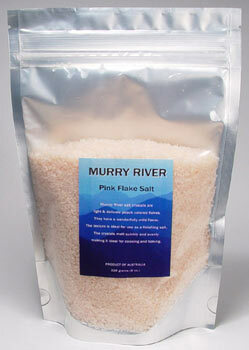 Murray River salt crystals are light & delicate peach colored flakes. They have a fragrant but mild flavor and are very attractive & elegant on the table. The Murray River is the largest of all rivers in Australia. The River basin's low rainfall and high evaporation have combined to concentrate salt in the groundwater. The salt is produced naturally from the underground brines in the Basin. The red pigment comes from carotene secreted from the salt tolerant algae. The underground saline waters have been lying dormant for thousands of years. The texture of this salt is ideal as a finishing salt. The flaky crystals melt quickly evenly. Comes in an 8oz. resealable pouch with label. Flake Crystal Sea Salts have a characteristic mild flavor. The pyramid shaped crystals are fragile enough to crumble easily between the fingers and have a totally different taste from regular grains of table salt. It's great benefit is its light delicate taste and adherence to food. In simple terms it sticks to food which makes it ideal for salting things like salad and French fries. Use it in all types of cooking. It is also very elegant as a table salt.